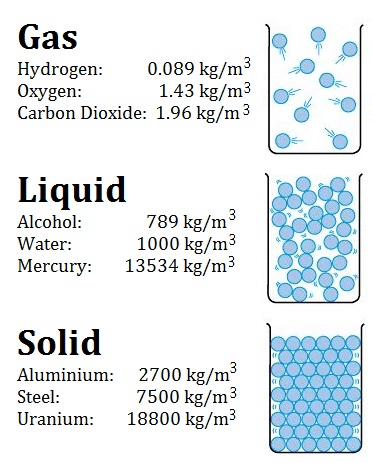 Typical densities of various substances at atmospheric pressure. In words, the density (ρ) of a substance is the total mass (m) of that substance divided by the total volume (V) occupied by that substance. The standard SI unit is kilograms per cubic meter (kg/m3). The Standard English unit is pounds mass per cubic foot (lbm/ft3). The density (ρ) of a substance is the reciprocal of its specific volume (ν). Specific volume is an intensive variable, whereas volume is an extensive variable. The standard unit for specific volume in the SI system is cubic meters per kilogram (m3/kg). The standard unit in the English system is cubic feet per pound mass (ft3/lbm). In general, density can be changed by changing either the pressure or the temperature. Increasing the pressure always increases the density of a material. The effect of pressure on the densities of liquids and solids is very very small. 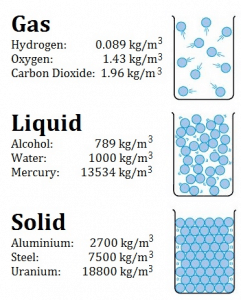 On the other hand, the density of gases is strongly affected by pressure. This is expressed by compressibility. Compressibility is a measure of the relative volume change of a fluid or solid as a response to a pressure change. where ∆T is the change in temperature, V is the original volume, ∆V is the change in volume, and αV is the coefficient of volume expansion. 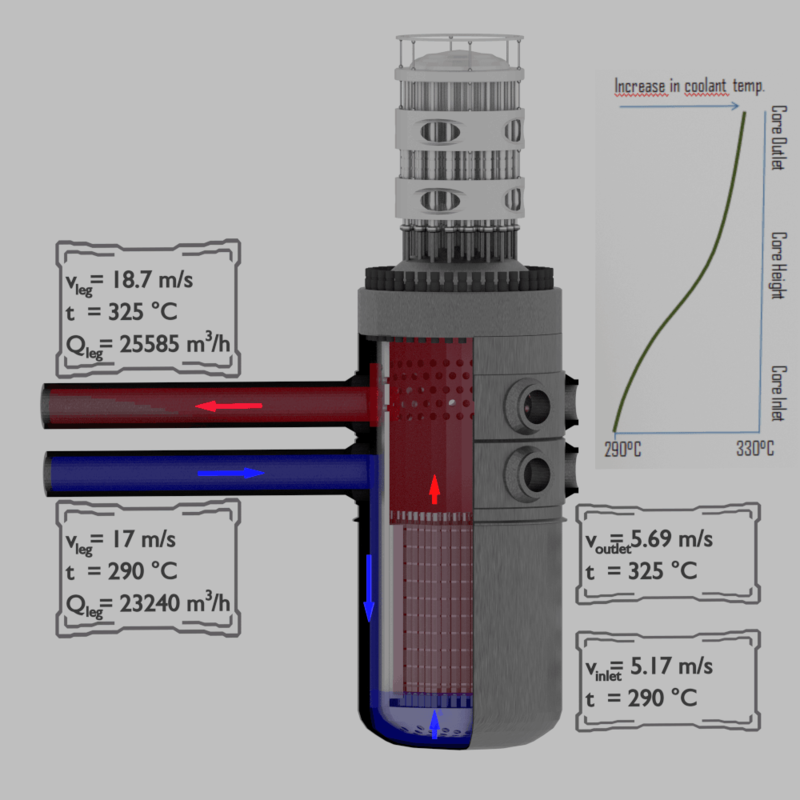 The primary circuit of typical PWRs is divided into 4 independent loops (piping diameter ~ 700mm), each loop comprises a steam generator and one main coolant pump. 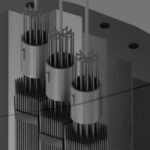 Inside the reactor pressure vessel (RPV), the coolant first flows down outside the reactor core (through the downcomer). 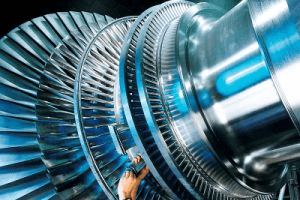 From the bottom of the pressure vessel, the flow is reversed up through the core, where the coolant temperature increases as it passes through the fuel rods and the assemblies formed by them. This fact has important consequences. 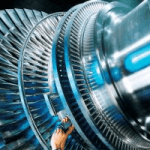 Due to the different relative power of fuel assemblies in a core, these fuel assemblies have different hydraulic resistance and this may induce local lateral flow of primary coolant and it must be considered in thermal-hydraulic calculations. Since nucleons (protons and neutrons) make up most of the mass of ordinary atoms, the density of normal matter tends to be limited by how closely we can pack these nucleons and depends on the internal atomic structure of a substance. The densest material found on earth is the metal osmium, but its density pales by comparison to the densities of exotic astronomical objects such as white dwarf stars and neutron stars. It must be noted, plutonium is a man-made isotope and is created from uranium in nuclear reactors. 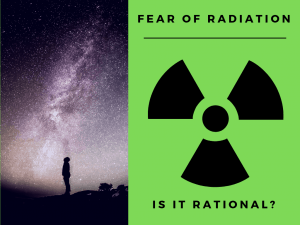 But, In fact, scientists have found trace amounts of naturally-occurring plutonium. If we include man made elements, the densest so far is Hassium. Hassium is a chemical element with symbol Hs and atomic number 108. It is a synthetic element (first synthesised at Hasse in Germany) and radioactive. The most stable known isotope, 269Hs, has a half-life of approximately 9.7 seconds. It has an estimated density of 40.7 x 103 kg/m3. The density of Hassium results from its high atomic weight and from the significant decrease in ionic radii of the elements in the lanthanide series, known as lanthanide and actinide contraction. The density of Hassium is followed by Meitnerium (element 109, named after the physicist Lise Meitner), which has an estimated density of 37.4 x 103 kg/m3. Pure water has its highest density 1000 kg/m3 at temperature 3.98oC (39.2oF). Water differs from most liquids in that it becomes less dense as it freezes. 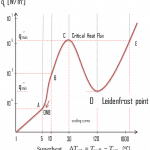 It has a maximum of density at 3.98 °C (1000 kg/m3), whereas the density of ice is 917 kg/m3. It differs by about 9% and therefore ice floats on liquid water. 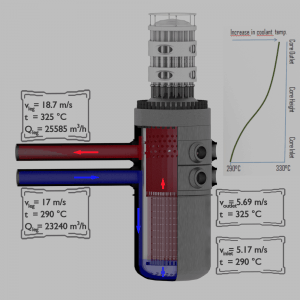 It must be noted, the change in density is not linear with temperature, because the volumetric thermal expansion coefficient for water is not constant over the temperature range. The density of water (1 gram per cubic centimetre) was originally used to define the gram. The density (⍴) of a substance is the reciprocal of its specific volume (ν). The specific volume (ν) of a substance is the total volume (V) of that substance divided by the total mass (m) of that substance (volume per unit mass). It has units of cubic meter per kilogram (m3/kg). Pure heavy water (D2O) has a density about 11% greater than water, but is otherwise physically and chemically similar. This difference is caused by the fact, the deuterium nucleus is twice as heavy as hydrogen nucleus. Since about 89% of the molecular weight of water comes from the single oxygen atom rather than the two hydrogen atoms, the weight of a heavy water molecule, is not substantially different from that of a normal water molecule. The molar mass of water is M(H2O) = 18.02 and the molar mass of heavy water is M(D2O) = 20.03 (each deuterium nucleus contains one neutron in contrast to hydrogen nucleus), therefore heavy water (D2O) has a density about 11% greater (20.03/18.03 = 1.112). 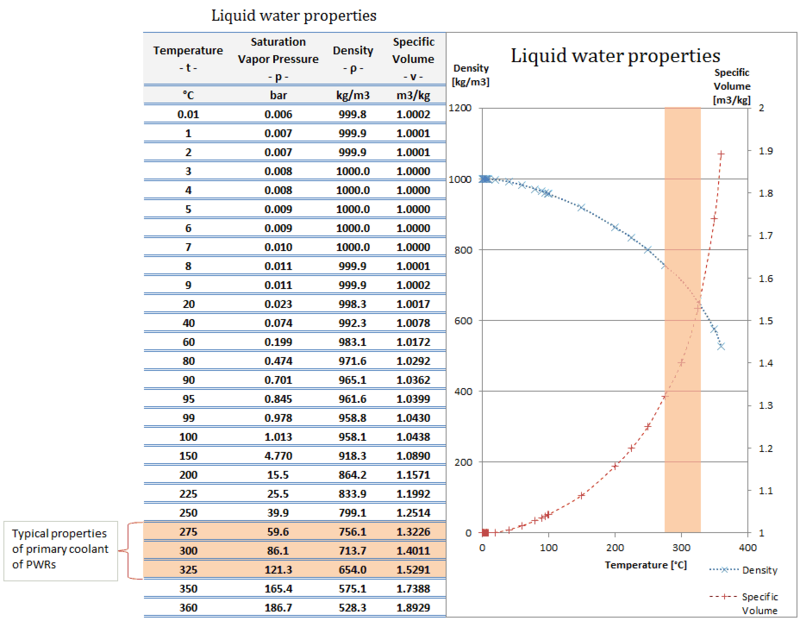 Pure heavy water (D2O) has its highest density 1110 kg/m3 at temperature 3.98oC (39.2oF). Also heavy water differs from most liquids in that it becomes less dense as it freezes. It has a maximum of density at 3.98 °C (1110 kg/m3), whereas the density of its solid form ice is 1017 kg/m3. 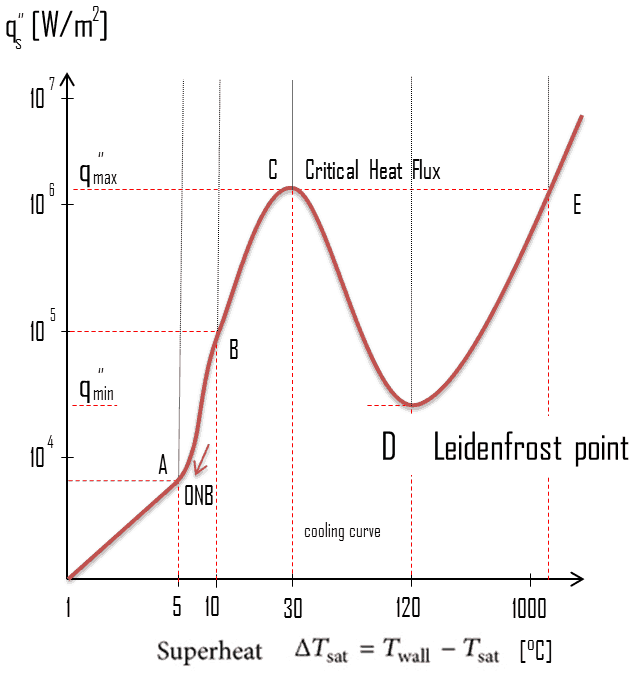 It must be noted, the change in density is not linear with temperature, because the volumetric thermal expansion coefficient for water is not constant over the temperature range. Water and steam are a common medium because their properties are very well known. Their properties are tabulated in so called “Steam Tables”. 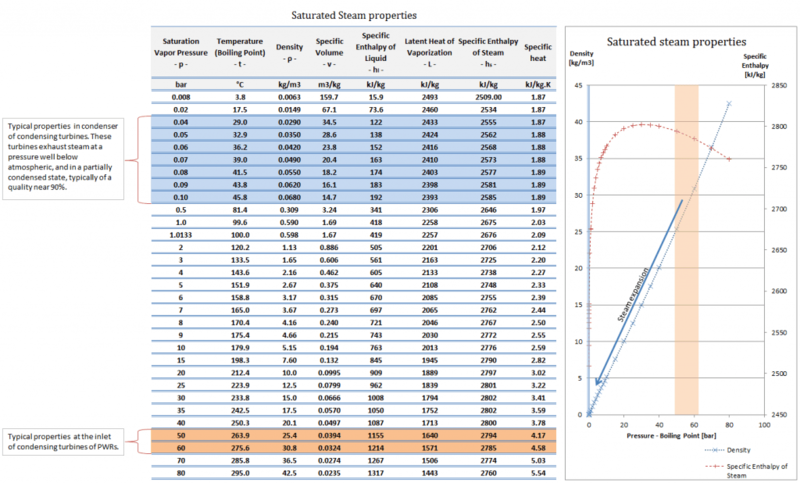 In these tables the basic and key properties, such as pressure, temperature, enthalpy, density and specific heat, are tabulated along the vapor-liquid saturation curve as a function of both temperature and pressure. The density (⍴) of any substance is the reciprocal of its specific volume (). The specific volume () of a substance is the total volume (V) of that substance divided by the total mass (m) of that substance (volume per unit mass). It has units of cubic meter per kilogram (m3/kg). The density of steel varies based on the alloying constituents but usually ranges between 7.5 x 103 kg/m3 and 8 x 103 kg/m3. In general, zirconium has very low absorption cross-section of thermal neutrons, high hardness, ductility and corrosion resistance. 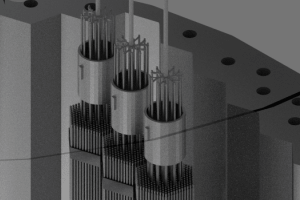 One of the main uses of zirconium alloys is in nuclear technology, as cladding of fuel rods in nuclear reactors, due to its very low absorption cross-section (unlike the stainless steel). The density of typical zirconium alloy is about 6.6 x 103 kg/m3. Uranium is a naturally-occurring chemical element with atomic number 92 which means there are 92 protons and 92 electrons in the atomic structure. Natural uranium consists primarily of isotope 238U (99.28%), therefore the atomic mass of uranium element is close to the atomic mass of 238U isotope (238.03u). Natural uranium also consists of two other isotopes: 235U (0.71%) and 234U (0.0054%). Uranium has the highest atomic weight of the primordially occurring elements. Uranium metal has a very high density of 19.1 g/cm3, denser than lead (11.3 g/cm3), but slightly less dense than tungsten and gold (19.3 g/cm3). But most of LWRs use the uranium fuel, which is in the form of uranium dioxide. Uranium dioxide is a black semiconducting solid with very low thermal conductivity. On the other hand the uranium dioxide has very high melting point and has well known behavior. Uranium dioxide has significantly lower density than uranium in the metal form. Uranium dioxide has a density of 10.97 g/cm3, but this value may vary with fuel burnup, because at low burnup densification of pellets can occurs and at higher burnup swelling occurs. Nuclear density is the density of the nucleus of an atom. It is the ratio of mass per unit volume inside the nucleus. 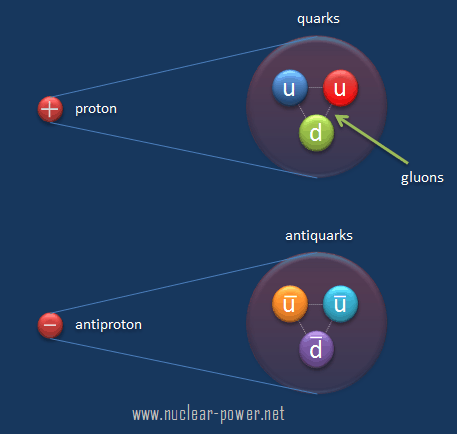 Since atomic nucleus carries most of atom’s mass and atomic nucleus is very small in comparison to entire atom, the nuclear density is very high. r = r0 . A1/3 = 7.44 fm. V = 4πr3/3 = 1.73 x 10-42 m3. ρnucleus = m / V = 238 x 1.66 x 10-27 / (1.73 x 10-42) = 2.3 x 1017 kg/m3. Thus, the density of nuclear material is more than 2.1014 times greater than that of water. It is an immense density. The descriptive term nuclear density is also applied to situations where similarly high densities occur, such as within neutron stars. Such immense densities are also found in neutron stars. The densest material found on earth is the metal osmium, but its density pales by comparison to the densities of exotic astronomical objects such as white dwarf stars and neutron stars. A neutron star is the collapsed core of a large star (usually of a red giant). Neutron stars are the smallest and densest stars known to exist and they are rotating extremely rapidly. A neutron star is basically a giant atomic nucleus about 11 km in diameter made especially of neutrons. It is believed that under the immense pressures of a collapsing massive stars going supernova it is possible for the electrons and protons to combine to form neutrons via electron capture, releasing a huge amount of neutrinos. They are so dense that one teaspoon of its material would have a mass over 5.5×1012 kg. It is assumed they have densities of 3.7 × 1017 to 6 × 1017 kg/m3, which is comparable to the approximate density of an atomic nucleus of 2.3 × 1017 kg/m3.